LOS ANGELES (AP) — Los Angeles city leaders honored the lifetime achievements of famed primatologist Jane Goodall by singing "Happy Birthday" to her on her 85th birthday. Reaction to the death of rapper Nipsey Hussle, who was shot and killed on Sunday in Los Angeles. LOS ANGELES (AP) — Mayor Eric Garcetti said Wednesday that Los Angeles is considering a major crackdown on illegal marijuana shops that have been bedeviling the city's legal marketplace. LOS ANGELES (AP) — Dockworkers fearing increasing automation will cost jobs in the Port of Los Angeles are fighting use of driverless electric cargo trucks. LOS ANGELES (AP) — It's been talked about for years, and now construction is underway on a people mover to carry travelers in and out of Los Angeles International Airport. LOS ANGELES (AP) — Los Angeles will abandon a plan to spend billions of dollars rebuilding three natural gas power plants as the city moves toward renewable energy, Mayor Eric Garcetti said Monday. Los Angeles Police Chief Michel Moore says he hopes a newspaper report that a special police unit is pulling over a disproportionate number of African-American motorists sparks a broader conversation about how best to interpret the data. 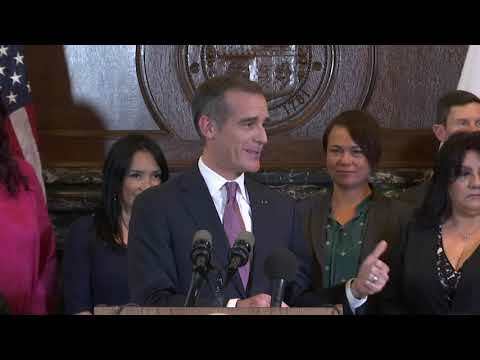 LOS ANGELES (AP) — Los Angeles Mayor Eric Garcetti explained his decision to sit out the 2020 presidential contest in simple terms — the city, he said, "is where I want to be." LOS ANGELES (AP) — Los Angeles Mayor Eric Garcetti will not seek the Democratic presidential nomination in 2020, slightly winnowing a field that is still likely to be large and unwieldy for a party desperate to oust President Donald Trump. LOS ANGELES (AP) — Crime is down in every category in Los Angeles and homicides are at their second lowest in more than 50 years, the city's mayor and police chief announced Monday. At 259, homicides in the nation's second-largest city fell 8.2 percent last year, while rapes were down 12.4 percent, gang crimes decreased by 8 percent and property crime went down 2 percent, Mayor Eric Garcetti said at a news conference . LOS ANGELES (AP) — The city of Los Angeles is offering free bus rides to all federal employees who work at Los Angeles International and Van Nuys airports and are not being paid during the partial government shutdown. Los Angeles World Airports announced Thursday that rides aboard the FlyAway bus service will be free for federal personnel with airport department security badges. LOS ANGELES (AP) — Los Angeles teachers returned to work Wednesday after contentious negotiations ended with a new contract and a commitment by the union and the district to work together to get more state money for schools in part by pushing to overhaul California's property tax system. LOS ANGELES (AP) — After helping broker an end to a teachers strike that marooned more than half a million students, Mayor Eric Garcetti said Wednesday the deal shows that government is solving problems in Los Angeles while Washington remains hobbled by a lengthy shutdown. LOS ANGELES (AP) — A Los Angeles teachers' strike that sent thousands of shouting educators into downtown streets, paralyzing traffic during a rainstorm and leaving a half-million students in uncertainty, isn't the kind of publicity Mayor Eric Garcetti needed for his potential presidential campaign. Los Angeles Mayor Eric Garcetti says a second day of renewed negotiations between striking teachers and the nation's second-largest school district ended without a deal. Garcetti tweeted late Friday that the "productive day" of talks between a teachers' union and the Los Angeles Unified School District wrapped up just after 9 p.m. PDT. He says negotiations will continue Saturday morning at his office. The office of Mayor Eric Garcetti announced Wednesday night that the union and officials of the nation's second-largest school district have agreed to resume contract talks at noon Thursday. His office says it will facilitate the negotiations. California's new governor is urging Los Angeles teachers and school officials to resume contract negotiations and end a massive strike by educators in the nation's second-largest school district. Gov. Gavin Newsom says in a statement Monday that the impasse is "disrupting the lives of too many kids and their families." LOS ANGELES (AP) — The union representing teachers in Los Angeles — the nation's second-largest school district — postponed the start of a strike until Monday because of the possibility of a court-ordered delay of a walkout. United Teachers Los Angeles previously said its 35,000 members would walk off the job Thursday for the first time in 30 years if a deal wasn't reached on higher pay and smaller class sizes. LOS ANGELES (AP) — Los Angeles Mayor Eric Garcetti says a newly released earthquake early warning app can give Los Angeles County citizens a few seconds to protect themselves before strong shaking arrives. Garcetti said Thursday the ShakeAlertLA app can make a difference if someone needs to pull over, get out of an elevator or drop, cover and hold on. 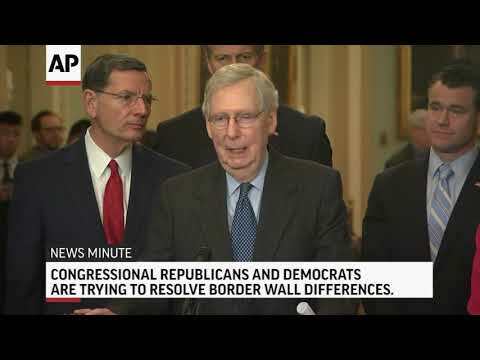 ABC's "This Week" — Sen. Ted Cruz, R-Texas; Reps. Beto O'Rourke, D-Texas, Peter King, R-N.Y., and Adam Schiff, D-Calif.
ABC's "This Week" — Sen. Ted Cruz, R-Texas; Cruz's Democratic challenger, Beto O'Rourke; Sen. Chris Van Hollen, D-Md. LOS ANGELES (AP) — The first shelter in what's planned to be a citywide network of temporary housing sites for homeless people was unveiled Wednesday by city officials who said the facilities will help down-and-out residents get back on their feet. Mayor Eric Garcetti and City Council members were on hand at a new downtown "Bridge Home," which will serve 30 men and 15 women who live in and around the area starting Sept. 10. The two-term Democrat intends to work with party volunteers to rally voters in advance of the November elections, and he'll also speak at a fundraiser for Ohio Sen. Sherrod Brown. LOS ANGELES (AP) — Traffic-weary baseball fans could someday travel to and from Dodger Stadium on a public transportation system underneath Los Angeles — if Elon Musk's latest bold plan comes to fruition. LOS ANGELES (AP) — A Los Angeles traffic officer hit by a car and killed while issuing a parking citation last week has been identified as a 45-year-old resident of the city. Authorities say Officer Gregory Park was struck Friday morning in Van Nuys. He died at a hospital. LOS ANGELES (AP) — Los Angeles on Tuesday approved using a $10 million fund to provide legal help to children separated from their parents at the U.S.-Mexico border. The City Council and county Board of Supervisors voted to expand the LA Justice Fund, created last year to help immigrants without violent pasts who are facing deportation. LOS ANGELES (AP) — The nation's second-largest city has a new police chief. Michel Moore, a 36-year veteran of the Los Angeles Police Department, was sworn in Wednesday by Mayor Eric Garcetti after the City Council voted unanimously to confirm his appointment. The move was expected after Garcetti recommended Moore for the job earlier this month, choosing him over two other candidates. Moore replaces Charlie Beck, who retired after more than 40 years with the LAPD. Beck became chief in 2009. Los Angeles has a new police chief. Longtime Police Department veteran Michel Moore was sworn in by Mayor Eric Garcetti after the City Council voted unanimously to confirm his appointment. The move was widely expected after Garcetti recommended Moore for the job earlier this month.